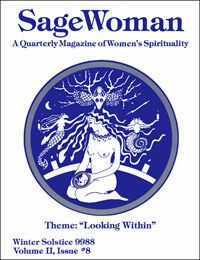 SageWoman #8 (reprint) Looking Within [sw008p] - $7.95 : BBI Media - Magazines that feed your soul. Lunaea writes, "This issue's cover shows a woman looking in a mirror, and seeing the magic and power of the Goddess in herself." This issue reflects Lunaea's vision perfectly, and every article displays a perfect mix of both compassion and empowerment. Includes: an interview with womanspirit musicians Diane Mariechild and Shuli Goodman, a photo spread of women's altars, three articles on journal writing, "Darkness is my Oldest Friend," by Anne Newkirk Niven, a meditation to meet the Crone of Winter, Solstice Carols, and much more. 56 illustrated pages, published by Lunaea Weatherstone in Winter 1988.